Gutters R Us offers a variety of guttering services from full replacement to partial repairs. To provide the best service to you, we have highly trained and experienced roof plumbers and installers and we’ll make sure to send our most experienced person in each field to you from quote to completion of your job. Searching for a Gutter Repairs Melbourne? We specialise in all aspects of roof plumbing including new homes, period style homes, retail stores, commercial buildings, warehouses and industrial buildings. At Gutters R Us, we offer professional advice and honest quotes for all our work. Our gutter specialists service all Melbourne suburbs. Our work is fully guaranteed and we remove all the rubbish from your site. 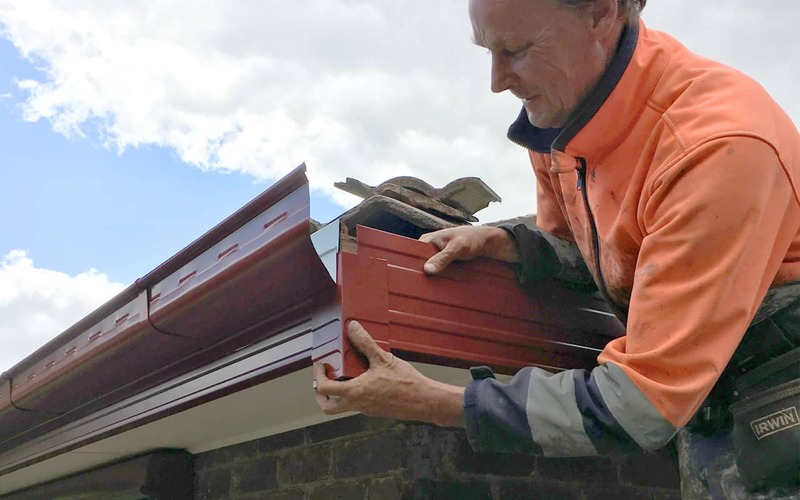 If you’re searching for Gutter Replacement Melbourne, Gutter Repairs Melbourne or Roof Plumber Melbourne, you’ve come to the right place. Not only do gutters give your home that finished look, they also act as protection against water damage. Having clear gutters will ensure the control of rainwater flow no matter how heavy – even in Melbourne! Our extensive range of Colorbond guttering includes Quad, Easiflow, Fascia Gutter, Downpipes, Spouts and Fascia Covers to match, with many more to choose from you will be sure to find a profile that compliments your home. Only fully licensed plumbers are used so your job will be carried out by professional tradesmen, and completed to the standards of the Plumbing Code of Australia.